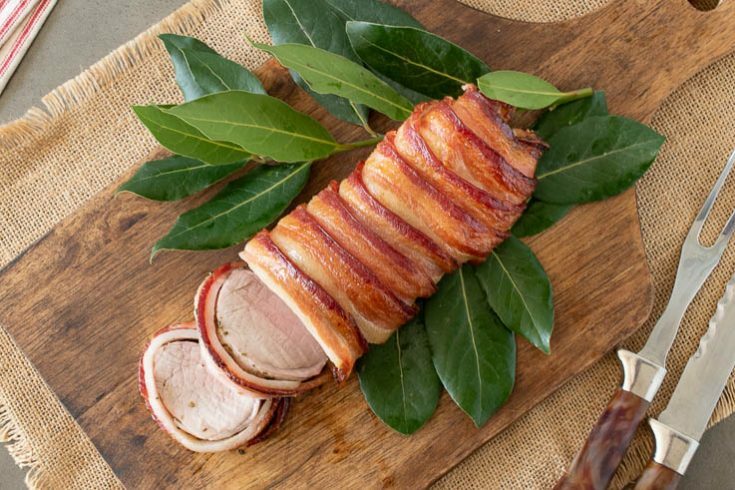 I’m changing things up this Easter and Maple Bacon Wrapped Pork Tenderloin is a delicious departure from the usual baked ham I like to serve. Ham is very popular for Easter and what I usually make, but this year I thought I would change things up and serve a pork roast. But not just any pork roast, this is a pork on pork roast. Where do I start with this recipe? Well, maple and bacon, hello! I have a huge weakness for crispy bacon and I admit, I trimmed a little of the edges as it came out of the oven (cooks prerogative). This roast is little smoky, a little sweet from the maple and the fresh rosemary just rounds it all out. If you’ve ever overcooked a pork tenderloin, you know that it’s like eating shoe leather. This is where the bacon helps by keeping it moist and adding all the flavor. I have other pork tenderloin recipes that make frequent meal appearances, balsamic roasted pork tenderloin, and a pork loin stuffed with cornbread. 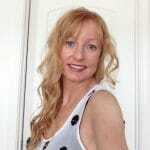 Check them out by clicking on the text for links. They are different cuts of pork and look different. The tenderloin is long, thin and lean filet that you usually find in the store shrink wrapped in plastic. The loin is a thicker cut usually with a layer of fat that is also quite lean. 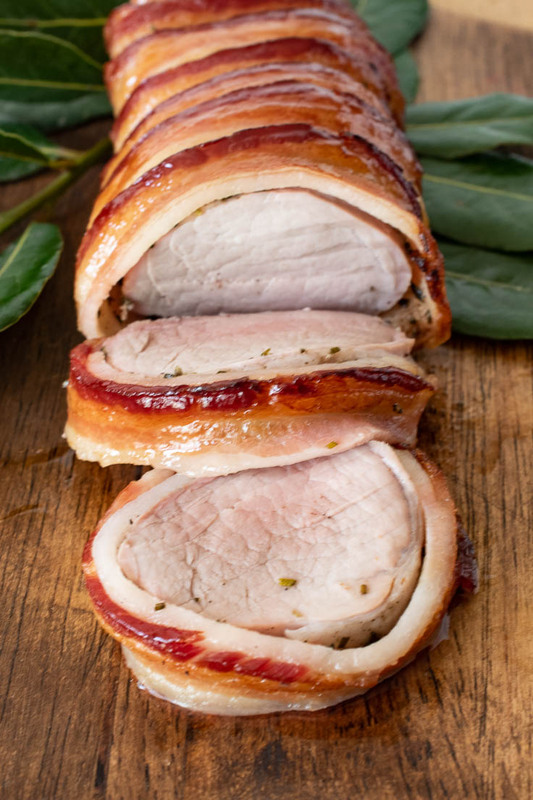 Since the pork is wrapped in bacon, the tenderloin is better for this recipe. Roast the tenderloin on a rack so the heat can circulate around the entire roast and the bacon on the bottom can cook and crisp up too. Use thin-cut bacon slices to ensure they crisp up nicely. When slicing the pork, the bacon may detach. To help prevent this, let the pork roast for about 15 minutes after removing from the oven. 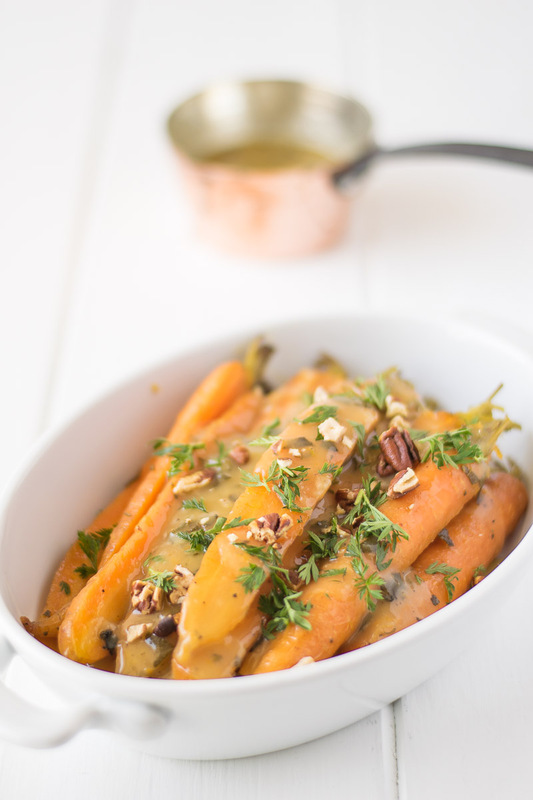 My favorite side dish to serve is crockpot honey, orange and herb glazed carrots (< click text for link). 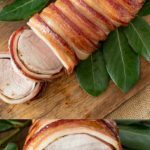 If you’ve tried this Maple Bacon Wrapped Pork Tenderloin or any other recipe on the blog then don’t forget to rate the recipe and let me know how it turned out in the comments below. I love to hear from my readers! 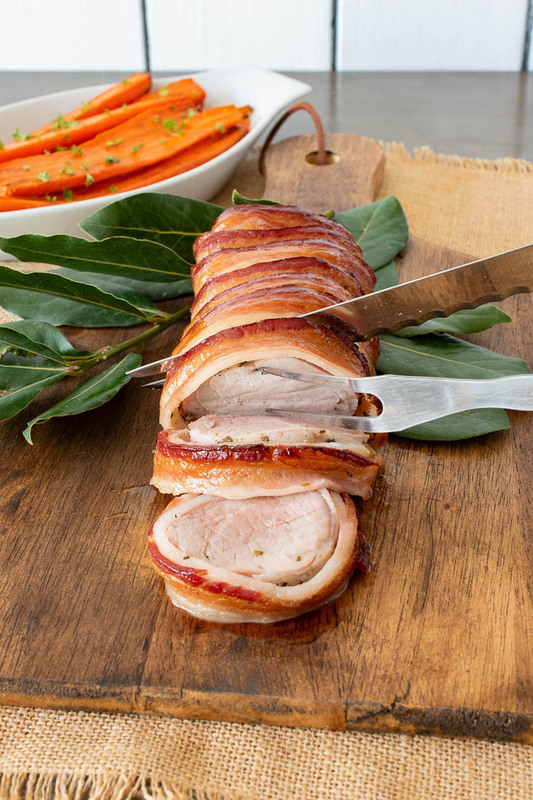 Pork tenderloin is seasoned with fresh rosemary, wrapped in bacon and brushed with maple syrup. Preheat oven to 450°F/230°C with the rack in the center of the oven. Mix the rosemary and salt and pepper in a small bowl. Drizzle the pork tenderloin with the olive oil and rub all over using your hands. Sprinkle the rosemary mix all over the pork and coat evenly. Lay the bacon strips out onto a cutting board the length of the pork, slightly overlapping. Place the pork at one edge of the bacon and roll tightly with the seam on the bottom. Place the pork on a rack inside a baking pan. Brush maple syrup all over the bacon. 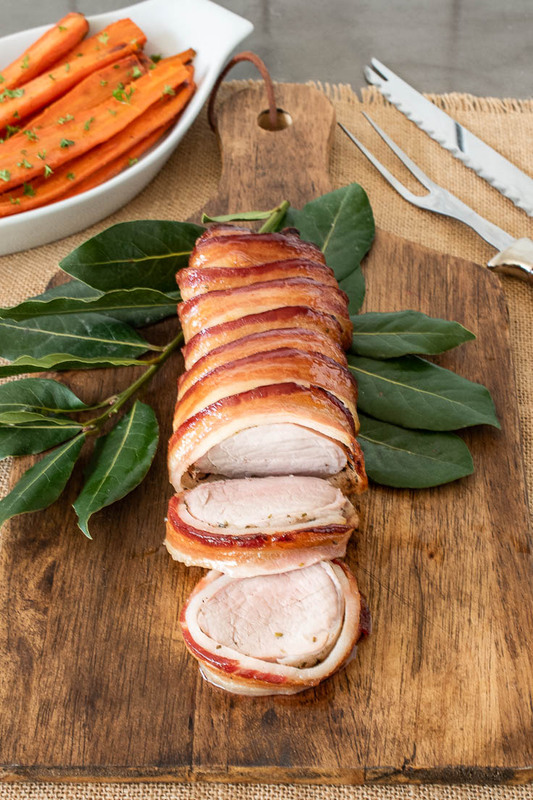 Roast the pork for 35-40 minutes, or until a thermometer measures 140-145°F (60-65°C) when inserted in the thickest part of the meat. Cooking times will depend on your oven and the thickness of the pork. Allow to rest 15 minutes before slicing.